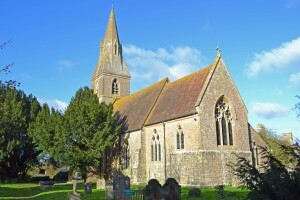 St. Mary, Sutton Road, Langley, Maidstone, ME17 3LY. For directions, please see map below. Langley’s Anglo-Saxon church was destroyed by fire and a new church was built during the 13th and 14th centuries. The Reverend William Bouverie Pusey, who became Rector in 1842 was not happy with the building and decided to construct a new church at his own expense on the foundations of the existing church which would be demolished. The new building was designed by William Butterfield and was dedicated in 1855. A toilet was built into the fabric in the 1990s but apart from that the church has changed little since it was built.